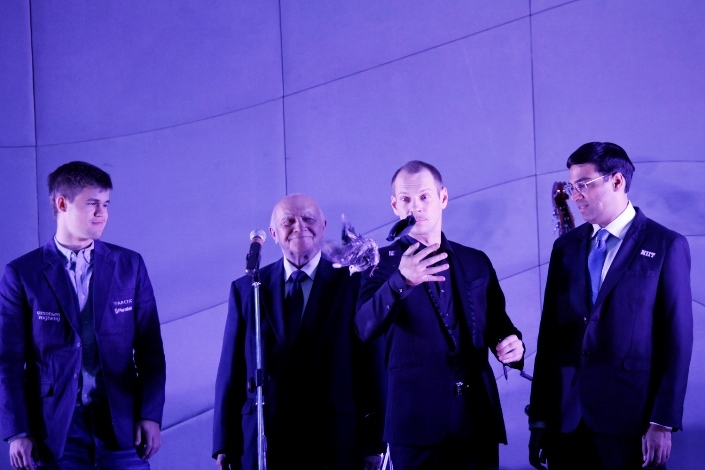 Viswanathan Anand and Magnus Carlsen have drawn the first game of their World Championship rematch in Sochi, but it was no repeat of the damp squib on the first day in Chennai. A razor sharp opening looked promising for Anand until he began to drift and Magnus got down to what he does best: “grinding his opponent into dust” (Svidler). There was a Bollywood happy ending, though, as Vishy found a precise path to a draw, later commenting: “I was a bit wobbly for a few moves and then I got back on track”. Our report includes annotations, tweets, press conference comments and a video wrap-up from IM Lawrence Trent. Want a quick summary of the day's action? Lawrence Trent, who spent most of the day commenting live on the TASHIR Petrosian Memorial, is at your service! Nothing matches the theatre and tension of the first moves of a World Championship match. We’re told the audience in Sochi was made up of officials and there were far less journalists than in Chennai, but frankly it didn’t matter one iota. ...but the chess wall is proving even more resilient. Anand tried and failed to topple it a year ago and this time round he's resorting to 1. d4 from the beginning. 1... ♘f6 2. c4 g6 A relative surprise, though Magnus did play it against Anand back in 2011. We can see that his attempts to improve his play in sharp positions this year were deadly serious - he's not afraid of complications even in a World Championship match! It also sends a message: "I'm very well prepared in theoretical lines". It's true that this "new" more theoretical and aggressive Carlsen, who appeared after winning the World Championship, has scored worse than before, but Magnus must have faith he can become a more complete player. 2... e6 was what Magnus chose in 2013 when Vishy finally decided to abandon 1. e4. He suffered greatly in that game, but that didn't stop him winning it. 3. ♘c3 d5 4. cxd5 ♘xd5 5. ♗d2 For years this was considered a secondary line but it's now one of the most fashionable ideas. Anand had already played it successfully on two occasions. 8... c5 as occurred in Anand - Hammer in 2013. Magnus decides not to follow his second in Sochi, but he does follow the path of a friend who may also be helping him out from a distance - Ian Nepomniachtchi. 9. ♘f3 ♗g4 10. d5 ♗xf3 11. ♗xg7 Anand deviates from previous play in which the bishops were maintained, though the difference isn't huge - the bishops will normally be exchanged eventually. The advantage of doing it now, as we'll see in the game, is that the c3-square is immediately available for the white queen. 14. ♕c3 f6 15. ♗h3 An ideal square for the bishop, preventing a black rook from coming to c8. 15. dxc6 ♕b6 16. cxb7 ♕xb7 wins a pawn for White but can't be recommended since the black rooks occupy the c and b-files and all the black pieces are preferable to White's. 15... cxd5 16. exd5 White plans to apply pressure on the e-file while threatening attacks on the kingside. The position is by no means easy to defend for Black, but Carlsen finds a way to coordinate his pieces defensively and gradually take the sting out of White's initiative. 16... ♘f7 The idea is to play Ng5. 17. f4 The natural response. 17... ♕d6 Hitting f4 and simultaneously leaving d8 for one of the rooks. 18. ♕d4 Defending the f4-pawn from what appears to be the ideal square, since the queen is centralised and acts across the whole board. However, the game shows that the queen is actually a weak element in White's position. 18... ♖ad8 Carlsen is now threatening to play the freeing e5, exploiting the pin of the d5-pawn. The following move is therefore "forced". 19. ♗e6 ♕b6! Carlsen has no fear of entering an ending and has already foreseen a later defensive resource. 19... ♕a6 seems similar, but isn't so precise due to a very concrete detail. 20. ♔b1 ♖d6 White can now play 21. h4 since after 21... ♘d8 22. ♗h3 Black doesn't have 22... ♘c6 due to 23. ♕e4! attacking the c6-knight and preventing the knight coming to b4. With the white queen on d2, as in the game, this isn't possible. 20. ♕xb6 axb6 leaves White with a slightly better ending, but the d6-square is available for Black and after f5-Kf6 it's unlikely Black will suffer much. 21. h4 was a natural continuation, but after 21... ♘d8 22. ♗h3 (22. h5 gives nothing after 22... ♘xe6 23. hxg6 hxg6 24. f5 ♘g5 ) 22... ♘c6 Black is doing well since the knight has the b4-square. 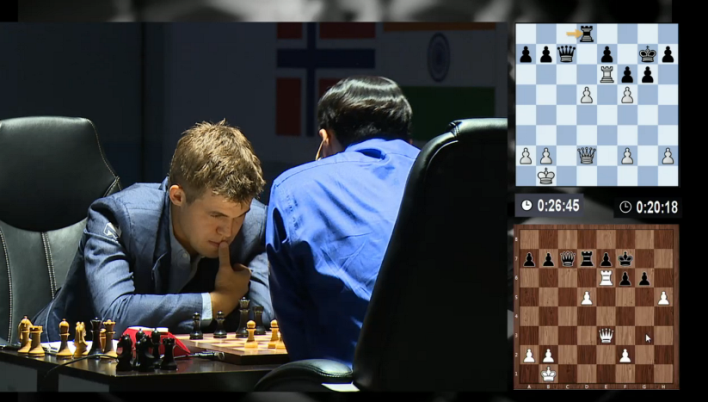 21... ♘d8 And almost magically Carlsen has made White's attack a thing of the past. Anand is now the one who has to fight to hold the balance. 22. ♗h3 would once more be met by 22... e6 So many problems due to one pin! 22... ♘xe6 23. ♖xe6 ♕c7+ 24. ♔b1 ♖c8 The black pieces are very harmonious, but Vishy finds a way to equalise. 25. ♖de1 ♖xe6 26. ♖xe6 ♖d8 27. ♕e3 ♖d7 28. d6! The key move. 31... a6 32. a3 ♕a5 Since f6 is well-defended by the rook Carlsen looks to pose problems with his queen. The white pieces can't increase their activity and, in fact, Vishy ends up somewhat paralysed. 33. f4 ♕h5 34. ♕d2 ♕c5 35. ♖d5 ♕c4 36. ♖d7 ♕c6 37. ♖d6 ♕e4+ Suddenly the black queen has taken control of the centre of the board that a few moves previously was dominated by its white counterpart. 38. ♔a2 ♖e7 And now Carlsen exploits the fact that there's no longer pressure on f6 in order to activate his rook. 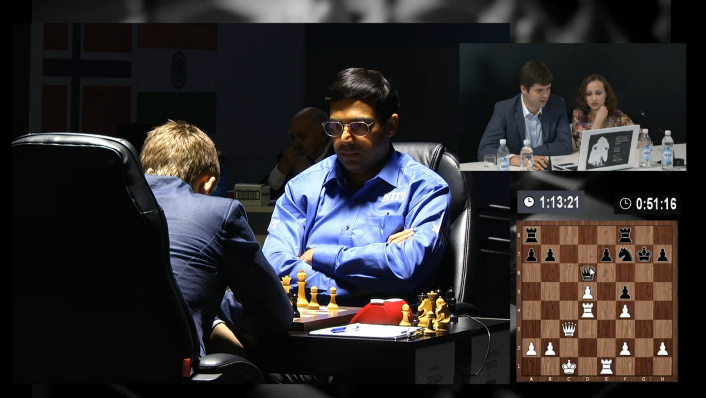 Anand decides to place his pieces very passively. 39. ♕c1 a5 Upping the pressure, with Anand down to three minutes for his final move before the time control. 40. ♕f1 a4 The b3-square serves as a wedge for the black pieces. 41. ♖d1 ♕c2 42. ♖d4 ♖e2⁈ Perhaps the only move of Carlsen's that you could criticise in the whole game. 42... ♖e3 would have posed big problems for Vishy, although I think he could have achieved a draw with 43. ♕d1 (43. ♖d7+ ♔h6 44. ♖xb7 ♖b3 45. ♖xb3 axb3+ 46. ♔a1 ♕xh2 looks miserable for White since he can never comfortably activate his queen.) 43... ♕xd1 44. ♖xd1 ♔h6 Preparing for a pawn race. It's difficult to know if White will achieve a draw, and in any case it won't be easy. 43. ♖b4! b5 44. ♕h1! The key move that solves White's problems. The queen threatens to penetrate into the black position and there's no way to stop it. 45. ♕d5 ♖e1 46. ♕d7+ ♔h6 47. ♕h3+ ♔g7 48. ♕d7+ Both players demonstrated great defensive technique - Carlsen in the opening when he seemed to be worse and Anand in the ending after getting into difficulty around the time control. What was clear, though, was that it was a great start to the match! The post-game press conference, meanwhile, was not really the icing on the cake the day deserved. The players were cagey, there were no great one-liners and you even missed the jaw-droppingly bad questions we came to expect in Chennai (if they were there we didn’t hear them, since the journalists weren’t hooked up to microphones). It was a little bit tentative at the start. At some point neither of us was playing particularly confidently… I wasn’t sure what to expect but I thought this idea with 15.Bh3 was nice – just taking away the square from the rook – and then it’s not so easy to get out. The key afterwards is that if I get to exchange queens, even under bad circumstances, that’s an achievement for me. I should be holding fairly easily. I was getting a little bit optimistic at some point, but when he found this idea with 43.Rb4 and 44. Qh1 I didn’t see a way to win. If there was a win, please tell, but I didn’t see it. I thought I had some chances to press – I tried the best I could, but I didn’t find anything. I’m not disappointed at all. Half a point with Black is good and I even had a little bit of pressure, so I feel it’s a good start. You always prefer to win, but I didn’t see anything. To be honest this position shouldn’t require so much work. Somehow some imperceptibly careless moves and then it started to get very annoying. I was down to about three minutes and allowing the pawn to a4 didn’t help. I was a bit wobbly for a few moves and then I got back on track. I’m slightly relieved. When I was getting wobbly and that pawn moved to a4 I thought I might get into trouble. I’m very happy I calculated the line with 43.Rb4. Once you find 44.Qh1 it’s fairly simple. It was a bit better this time. I remember once during the chess Oscars in 1998 we had a magician and he stole my watch. At least this time it was very much more straightforward. In general I’m more comfortable playing chess. Happy to be doing that just now! It's same time, same place for Sunday's Game 2!